Starring Nadine Labaki/Layale, Yasmine Elmasri/Nisrine, Joanna Moukarzel/Rima, Gisele Aouad/Jamale, Adel Karam/Youssef, Sihame Haddad/Rose, Aziza Semaan/Lili, and Ismail Antar/Bassam. 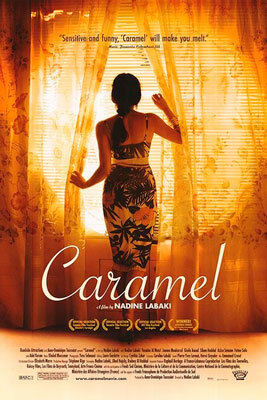 The prologue to Nadine Labaki’s Caramel finely-crafted film underlines the point that it takes a lot to shape a woman’s character. Taking place around a table, several women are playfully cooking and eating a batch of warm, amber-colored caramel. Some of the sugared paste is also being stored into jars to use for hair removal in their shop. Caramel’s tale of friendship and love, set in the Middle East, can easily strike a universal chord in every woman. Nadine Labaki’s directorial debut takes that warmth to weave a tale of sisterhood involving six Lebanese women who laugh, cry, and celebrate life in a beauty parlor called Si Belle. Ms Labaki’s efforts were rewarded by winning an Argentinean Film Critics Association Award, a San Sebastián International Film Festival Award, a Satellite Award, and a Stockholm Film Festival Award. Situated in on a busy Beirut street, Si Belle stands out, not for it’s lack of a glamorous façade, but because the letter B in the storefront’s sign is literally hanging on by a neon thread. This pretty much describes where our six heroines are at the beginning of their story. Layale literally flies off to meet her lover, a married man, in the middle of client's coiffures, leaving them astounded and her co-workers frazzled. Youssef, a traffic cop, watches her flight with a wishing heart. Nisrine is engaged and fretting that her fiancée will discover on their wedding night that someone else got there first. Rima, the shampoo girl, wistfully sighs and shares stolen glances with a beautiful customer. Jamale, a frequent customer and good friend, stubbornly refuses to acknowledge her retreating youth, by continuing to audition for acting roles meant for fresher faces. And Rose looks after her sister Lili, retreating further into her tiny tailor shop as life passes her by. The ensemble cast delivers a fine set of performances, as Labaki gently coaxes her cast to the finish line, through a series of long shots and polite close-ups. Laure Gardette's editing is a bit choppy, yet is forgotten while Khaled Mouzannar's playful musical score is playing. Amid the touch-ups and back-combing, laughter and sighs, Caramel reminds us that life's ups and downs are easier to bear with a sister close at hand.